Hi. Too bad there is too much theft risk to install those panels at your cabin. Our system has worked well for about ten years now,with the exception of the lightning strike. manufacturers and sellers claim, they can even save money in the long term, even with the big initial expenditure. Flooded lead acid batteries like the T105 do have one nice thing... the ability to take sp gr readings of each cell. That can tell you exactly what the condition of the cells is. I keep a log book of the readings of each cell. Lithium have to be charged when the battery is above 32 F. Not a big deal but in my case, I will have to do something about that when I change to lithium. But that is a few years off as I just put new lead-acid into service this summer. If your plan is to have the solar and batteries as a backup to operate the well pump as well as use solar power "to run a fridge or some outbuilding lights etc. and cut back on our grid use", those items will need to be separated from the other grid-tied circuits. There can not be any way the power grid and power from a generator or inverter can be "mixed". 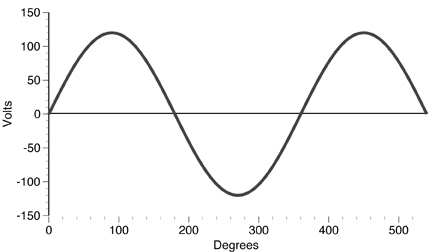 Simply put the peak and valleys of two AC sources to be combined must be matched, otherwise, damage is going to occur to at least some of the equipment. Your equipment or the power company equipment. When generators that are designed to be parallel connected the engine speed, the waveform, the voltage is all matched. If the voltage is off a bit between the two sources damage can occur. Same with inverters, some are are designed to be parallel connected, many are not. The ones that can be paralleled will sync the waveform, etc. None of those can easily be sync'd to the power company system as far as I know. The inverters and other equipment used in a grid tied solar system are designed to be compatible. The power company will have a list of approved equipment. The AIMS are almost certainly not on the list. So, if a portion of your home is grid-tied and a section is not, you would need to totally separate the non grid powered fridge or whatever circuit from the grid powered balance of the system. Or you make a proper grid-tied connection between your solar panel system and grid approved inverter and use the grid as a battery. This needs to be coordinated with the power company and all equipment approved and the installation inspected. FWIW, most grid-tie systems don't have any batteries, but backup batteries may be included with proper design, approval and proper automatic safeguards to keep your power completely separated from the grid when the grid loses power. Many people hire this out but with guidance, a DIY person can do it. Member Dave Sparks can help with system design and equipment purchase. Dave charges a fee for his services and really knowsHis contact emailis on his website. his off-grid power. There is a very real danger to power company workers if a non-authorized power source like a generator or solar inverter system is supplying power into a power grid that is not powered by the grid system. Another member here has a standby, automatic start generator, that will take over and supply power to the home when the grid goes down. It has automatic controls to maintain isolation from the grid. We reduced our power company bill by replacing the old furnace, the old A/C and the appliances and old electronic gear over several years time, as well as changing every light bulb to an LED. Our power company has a three-tiered rate system as many do. We seldom ever get into the second tier and never into the third and most expensive tier. We have lower total power use/costs than even some of our neighbors who opted for a solar lease or power purchase agreement. Of course, we also go dark if the grid fails, but in our area, the grid has been very reliable. If it wasn't I would probably go with a good generator system running off propane or natural gas. I hope you find all that useful. More questions welcomed. Yes, that is a shameless plug for Dave, and no, I do not consider this spam as we know Dave to be qualified and honest. MtnDon, I had planned to pull any circuits that I run on this solar system away from the grid and keep this system off the grid completely. The location I have chosen for the panels and the electronics and batteries is very close to the panel that my well and outbuildings that I want to run on this system so it would be pretty easy to just install a breaker panel and rewire these circuits directly to this off grid panel. That has the Kid working at half capacity (amps) more or less. Better than working close to the maximum, as far as theory goes. It also cuts the parallel batteries down to only 2 deep; much better than as is now. If those batteries are about 115 amp hours each then you would have 115 x 2 = 230 AH @ 48 volts = 11040 watt hours. At 50% max discharge = about 5 Kw usable power. 230 AH would be served well with a 20-25 amp charge input. The 4 panels on the Kid would supply 21 amps at 57.6 volts (equiv to 14.4 on a 12 volt battery). Just about ideal for charging. Now find a 48 VDC inverter. So here is my plan, tell me if I have this right. I will lay everything out the same as above except rather than the 12 volt trolling motor batteries I plan to buy 8 of the Trojan T105s (225AH) and wire them the same in two series strings of 4 batteries each and then connect those strings together parallel. 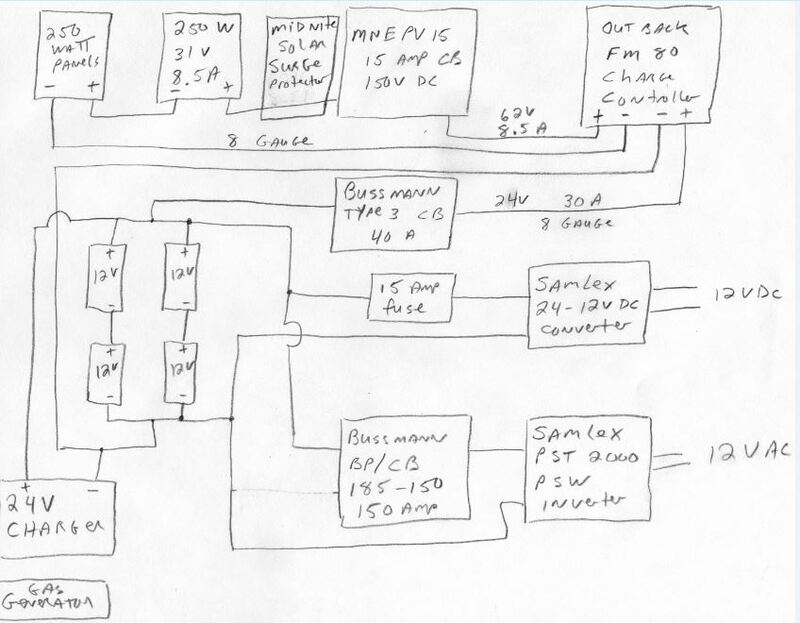 (6v x 4=24 volt series strings x2) This should be a 24 volt setup instead of the 48 volt but should make 10800 watt hours which is very close to your original design that you did for me in 2014. 225AH x 2 = 450 AH @ 24 volts = 10800 watt hours. At 50% max discharge, This should still be about 5 Kw usable power. Hopefully my math is correct. Unless I'm better off wiring all 8 batteries parallel for a 48 volt system. I do plan on adding 8 more batteries and 4 more panels at a later date but it will probably be awhile to come up with the funds. 6000 Watt, 18,000 Watt surge, 24 Vdc, 120 & 240 Vac, Inverter, Charger & Transfer Switch. 50 amps @ 120 Vac. Input charger 240 Vac. This AIMS Power Low Frequency 6000 Watt 24-volt Split Phase Power Inverter Charger is not your average every-day power inverter. What you see here is our top-of-the-line power inverter, built for the purpose of running your whole house (smaller home), business office or large RV. This inverter charger is perfect for your off Grid system or for use as an emergency backup supply. The 110/220 split phase inverter is capable of producing 2 legs of 110v, making this inverter perfect for home and shop applications with a 220 panel in place. However, the inverter can utilize grid-power to charge the batteries and send the power out to your application using the built-in 85 amp charger. If the grid power is lost, this inverter is equipped with a seamless transition transfer switch, becoming a true UPS (Uninterruptable Power Supply) when you need it in emergency situations and natural disasters (battery required). This inverter charger has an on optional LCD remote showing you of any abnormalities on all parts of the system, giving you ample time to fix the issue and exactly where to look. This inverter charger also comes with an Auto Generator Start mode that can tell a generator to start up and begin providing charge to the batteries (through a separate charger on 120v gensets) or providing power to the home. Need to use this in a different country or with 50hz electronics? This whole house inverter comes with Auto Frequency Detection software, providing you with the correct power frequency on either 50hz or 60hz. Am I better off with a 48 volt bank? So 8 batteries in parallel because I'm going to add another string later on? Is 2 strings of 8 batteries better than 4 strings of 4 batteries? Or will my charge rate be insufficient? In hind sight looking at the numbers I think it will be insufficient. Sorry about all the different posts. Just trying to figure out all of this as I wait for your vast knowledge on the subject...LOL. I'm learning as I go and want to get it right. I sure don't want to ruin my batteries from an insufficient charge rate or order the wrong inverter or some other issue that I have wrong. Sorry, I'm not ignoring you but have found myself in the middle of some neighbors with frozen pipes and a leak or two. 225AH x 2 = 450 AH @ 24 volts = 10800 watt hours. Wouldn't the charge rate of 21 amps at 57.6 volts be better suited for the 48 volt system @ 225AH rather than the 24 volt system recieving 21 amps at 57.6 volts for 450AH? The only question is ...Is an 8 string of six volt batteries better than two strings of 4 batteries? Of course if I expand into double the solar panels and double the batteries I would be looking at two strings of 8 batteries or four strings of 4 batteries. Seems like the 8 battery string would be better and the charge rate better suited for the 48 volt battery bank. A series string of those T105 batteries is better than having the same number of T105's in two series-parallel strings. The panels you have work out well to charge the 48 volt battery bank with a KID MPPT controller. MN has a string sizing tool for checking that. If the same 2S 2P configuration of solar panels was tried on a 24 volt battery bank, the KID will be overpowered with too many watts. 24 volts won't work. If you wanted more panels you would also need another controller as with the 4 panels in 2S 2P it is at about 75% of capacity. Or buy a larger capacity controller. I have no idea how much surge capacity you will need to start that well pump. No easy way as far as I know for determining that. It would sort of be a shame to have to get a huge inverter only to cover the pump surge. But maybe unavoidable unless you can fund a new low surge well pump. There are some you could run right off the panels without any inverter. As for running other household items as long as they are completely on their own system so your system cannot power up a dead grid you should be fine. How old is the fridge you might power? If it is anywhere near time to replace it you could buy an inverter compressor fridge and not have any startup surge there either. LG and Samsung sell some fridges like that. Often it is hard to find what tech the compressor uses when looking at fridges or the spec pages. Those new compressors all have a 10 year warranty on the compressor so that can help weed out the old style compressors. Some of those compressors are also known as linear compressors. No surge, virtually silent, I really like them. With a new well pump and fridge the inverter could be made much smaller. Just a thought. Thanks MtnDon. BTW, I traveled near the mountains where you live a few years back on a run to pick someone up in Oregon from Central Texas. Beautiful country for sure! I am planning to put my 24 VDC solar system together this year. Up until now I have been running 12 V LEDs and my water pump off a single deep cycle battery charged by one of my solar panels. I had planned to do a 12 V system, but the more I read and understand, a 24 V system would work better and give me more options in the future. I have two 250 watt solar panels and am using a Trace MPPT charge controller. The Tracer will handle the 2 panels hooked up in series. I plan to purchase an Outback FM 80 charge controller so I can add more solar panels in the future. I'm thinking of buying a 24 V Samlex 2000 watt PSW inverter for AC power. I'll use a 24 V to 12 V converter to drop down the DC for my 12 V lights and pump. This is a sketch of what I am currently thinking of. All comments or suggestions are welcome. I have to read up some more on lightning protection. One question I have is about tying a 24 V battery charger into the system. Do I need to disconnect the charge controller when I am charging the batteries with a battery charger? I have read that it is not necessary to disconnect it, but I'm not sure if charge controllers have circuitry to prevent back feeding power or not. I know some inverters come with integral battery chargers but I would prefer to have them separate. It is advised to put a breaker in the + line from PV panels to the charge controller; close to the controller. This makes it easier for setting up the CC. The procedure is to first connect the CC to the batteries. The CC usually ID's the system voltage. Then, once that is set the input from the panels is connected. A breaker makes it easier than connecting wires to terminal lugs, IMO. The MN surge suppressor needs a good ground to earth. That is best achieved with two earthing points about 16 to 20 feet apart and joined to each other by a single continuous ground wire that also connects to the MN-SPD ground. It is also a good idea, IMO, to use another MN-SPD on the AC circuits side. I like the MN-SPD a lot. They have a warranty and they honor their warranty. We have had to replace them a couple of times as we are in a lightning prone area. Re the grounding rods: the NEC calls for no more than 25 ohms resistance. To measure that you need two grounds in the earth. Disconnect the ground wire that runs between them and measure the ohms between rods. You should have less than 25 ohms. The lightning folks I have dealt with recommend 10 ohms, or less. Ifyou have much lightning activity you may also want a separate lightning rod and grounds system. Batteries? What kind and what AH capacity? Lead-acid? Flooded or sealed batteries? You may be able to make a better battery bank by going to 6 volt or even 2 volt batteries and having a single string of them in series to make 24 volts. We have a Samlex inverter as a backup spare. We have been lightning struck. I like a combination inverter/charger best of all as they have a better charger builtin than most of the stand alone chargers out there. The Outback, for example, can have the maximum charge rate programmed. If starting a charge off the generator their inverter/charger will ramp up to the preset maximum rather than slamming the generator with a full power surge demand. Having the CC and the inverter/charger both by Outback also lets you use a Mate to tie everything together with cat5 cables and set and read data inside. If you have not looked at that you should before you buy the hardware. Yes, it will cost more but I do love our system. Do you have inspections to meet? The Samlex inverter is NOT meant for hard wired use. If you need to pass an NEC inspection the Samlex will not work. If you have no inspections and go ahead and use an inverter with receptacles built in be aware that those types of inverters usually have an internal bond between the neutral and ground outputs. Therefore do NOT implement the service panel bond that is normal in a residential AC service panel. Having a panel neutral-ground bond with AC coming from receptacle outputs on an inverter will burn out components in the inverter... release the magic smoke. Complete toast. There were some significant changes made to the NEC a couple of years ago. I have to admit I am NOT conversant in the changes. Some or all, of the changes were to protect first responders in emergency situations. Sorry, but I am not certain of what the changes entail for an off grid system. It may be more to do with grid tied systems and may be only with roof mounted panels. Maybe Dave Sparks will comment. We also use a Samlex 24to12 converter to run a few small 12 volt items. Thank you for the comments MountainDon. I don't have to do any electrical inspections in my town. That is one of the reasons I bought the property. I only needed my septic system inspected and need to call in the fire chief to look at my wood stove installation. That said, I want to do my electrical safely, so I don't burn the cabin down! I am planning on four 12 volt flooded lead acid marine deep cycle batteries. They are 115 amp hours and I can get them for about $110 each. I know that 6 volt fork lift batteries would probably be better, but I will need a learning curve for taking care of my batteries and I would rather start out with cheaper ones and then move to better ones when I am more experienced. I will look more into combined inverters / battery chargers. I see your point about charging the batteries gracefully instead of slamming them with max amps right away. I do need to stay under $1000 for my inverter, so the top of the line is out of my budget. I will definitely put a switch between my panels and the charge controller. Thanks for the lightning / surge suppressor info and especially the grounding info. I need to bone up on grounding. I have a metal roof on the cabin which will be higher than the panels; I don't know what is more likely to get struck first. I am surrounded by tall trees as well. I am planning on four 12 volt flooded lead acid marine deep cycle batteries. They are 115 amp hours and I can get them for about $110 each. Do you belong to Costco or Samsclub? For $90 to $100 each (where I live) I can usually get a 6 volt golf cart battery with about 210 to 220 AH capacity per battery in that price range. Four of them in series gives you pretty much the same capacity at 24 volts that you would have with 4 of those 12 volt batteries in a series-parallel configuration. The golf cart type batteries have thicker lead plates than any 12 volt battery sold as a marine or RV battery. That makes them better for the deeper discharges you are likely to use in an off grid system. Some Walmarts will have golf cart batteries in stock as well. Less money, better battery and the all series is better for the batteries. Try to avoid parallel batteries if at all possible. There will also be a core charge but that should be the same for a 6 volt golf cart battery as for a 12 volt marine/ rv or auto battery. Last year the core charge here was $12 IIRC, though it might be $15 now. You get that back when you trade the old one in for a new one. Along with the flooded batteries buy a good hydrometer and a notebook to log the specific gravities. The Hydrovolt battery hydrometer seems to work well and compensates for temperature. They are German and I noticed a while back that Midnite seems to have bought the rights for the USA. Rinse with distilled water after use is a good idea with any hydrometer. Also one of the battery water dispensers you can find at NAPA, and other auto parts stores. Even Amazon. They make filling easy as they have an autostop device. Lightning? There seems to be no rhyme or reason to how it strikes. It goes sideways as well as up or down. A higher metal roof is no guarantee of anything, IMO. We had burn marks around the eves as well as lower down the slope at the array. Virtually everything with a silicon chip blew, except for a $59 microwave. Can't figure that one out; it has digital touchpad controls and we still use it. Circuit breakers on the DC PV lines were blown apart. One of the GFCI's ceased working. The more or less center pine in a cluster of four 75 foot pines had spiral lightning tracks and died; the others are still fine. I will look more into combined inverters / battery chargers. I see your point about charging the batteries gracefully instead of slamming them with max amps right away. My meaning was more that the gentle ramp up eliminates the start up surge a conventional charger has. No surge is easier on the generator. ..... 4 of the 6 volt GC batteries have half the number of cells, compared to a 4 x 12 volt bank. Don is correct about the golf cart batteries rather than the deep cycle batteries. Marine/auto Deep cycle batteries become toast in a very short time. I also like the Costco GC batteries. Now I have gone to a $4000 875 amp @ 6 hour forklift battery with tubular plates.....​Very satisfied with it. The manufacturer is in San Leandro near one of our jobs and he sets them up special for solar customers with float caps to see the levels instantly. Costco GC's are hard to beat. For an emergency temporary repair, I use them for places that are at lights out. Keeps them off the genset until they decide what is next. I saw few offgrid lights out this summer during the Ferguson fire. How did you do Glen during that nasty 6 weeks? Still finding limes for the Pacificos? "we go where the power lines don't"
Yes, we belong to Costco. I looked on their website and they sell 6 volt Interstate GC batteries with 225 amp capacity. I'll take a look this weekend and see what the prices are. I assume they are around $100 each. Now I understand that the GC batteries in series would be only half the number of cells to take care of as opposed to the 12 volt battery setup I sketched. Thanks for the tips! I started looking at 24 volt inverters / chargers. I can't afford the high end ones like Outback and Magnum, so I looked at the AIMS 2000 watt which costs about $650. The remote switch/panel is another $100. I was reading the manual and it said I would need a generator with 150% capacity of the inverter. So I think that would be a 3000 watt generator I have a Champion 1500 watt generator; I like the size - I can carry it around myself and don't want to buy a bigger one just to run an inverter/charter. I could buy a separate 24 volt charger and run it off my current generator. I'll keep looking. Well, Dave, I thought you would never ask... I was getting frozen steaks out of my freezer for a barbecue on the day all of those people on that reliable grid power were having a free dump day to dump all of their thawed frozen goods. For the poster, if this is for the long haul, you may find that using cheaper equipment, only saves cash the first time you buy it... Do it right and buy equipment that will supported. I only use Schneider and Outback but now that Magnum makes a cc they are on the list. Stay with the same brand and you can get site data over the internet if that is important. You may find later that it is. When we built the same lady, I think told us we could build an offgrid home but we could not live in it. During the worst of the smoke we were working away from home. San Leandro I think. We were home on some mildly smokey days. A friend working for the fires said if the fuel supplier would quit selling the CDF diesel to restart the fire it would have went out. During the smokiest days they could hardly get it to relight. Yes, that is true. If it goes out too fast they will not get as much funding next time, and many areas had not burned in years so this was their opportunity to burn it un interrupted by the tree huggers. As you know, years of forest mismanagement under Governor Moonbeam and friends have created many unsafe areas. Keep the limes ready and hopefully we get a Friday off some day soon. Yes, we are self employed, and can take off anytime we like.... But our customers must come first so if they need us we work, even putting off our trips to Myanmar to see family. Ingrid retired last year and I am 1/4 time at Offgrid Solar so let us know. Looking forward to meeting her! Hey Dave, I have to guess that you are topping off all of your tanks this weekend.